The Musical Keys that Opened Iraqi Hearts in Baghdad! "Iraqi Love Songs Were Our Passport!" Love Songs of Planet Earth are our Guide! Book these Shows and Workshops now! Leaving Fear Behind: Peace through Music! Cameron and Kristina have now provided more than 300 Concerts and Presentations around the world. Discovering the ancient wisdom of love! What messages and secrets do these beautiful ancient melodies and cultures reveal? "Bring These Awesome Artists To Your Church or Center!" 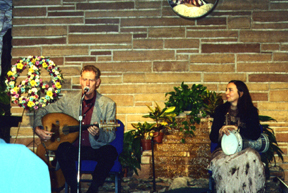 "Cameron & Kristina...build bridges between Western and Arab cultures through...music. It’s not every American musician who can claim to have learned to play the oud (Middle Eastern lute) like an Iraqi, mastered the complexity of the maqam scale system and played love songs on a Baghdad street in the dangerous aftermath of the US invasion of Iraq. But then Cameron Powers is not your ordinary musician." Cameron and Kristina have been made honorary Ambassadors for Peace! "...the most enthusiastically ever received at our Church... You will be delighted, informed, and spiritually uplifted." "Cameron's and Kristina's music is deeply moving and spiritual, coming from the hearts and souls of our oldest civilizations and ancestors. The deep love and care for people of all cultures, seeing the Divine Oneness with all our brothers and sisters, that these two feel is healing in and of itself and is enhanced by the inspiring stories and depth of knowledge they share so delightfully with their audiences. Their message is spiritual not political and unites the human family through music, song and sound. We are delighted to have them back to a larger audience to enhance our outreach and spiritual growth. Thank you for the healing work you both do on our planet." "Cameron and Kristina created a bridge of love between our spiritual community and the native Arab culture of the Middle East, a culture which so many people don't really understand." "Kristina's enticing singing and Cameron's multi-faceted instrumentals with the oud and nay bring a harmonious presentation of one of the world's oldest musical traditions." "Thank you so much for everything you offered to our congregation. I am still receiving positive comments . It was also a great pleasure and honor to be able to actively engage in helping to promote your peace work. I really fell in love with your open hearts and very warm and easy going personalities. It was a joy to work with you. I wish you continuing success in your endeavors and hope we will have an opportunity to collaborate again. You will always be welcome here." "O how you blessed us. I cherish the memory. May all your journeys go well. May people get it! And, if you are ever back this way.... the door is open. Proceeds from Musical Missions of Peace events benefit our Non-Profit Organization and can simultaneously give back a percentage to your own congregation!